Your birds will have a swinging good time on the Picatchou. 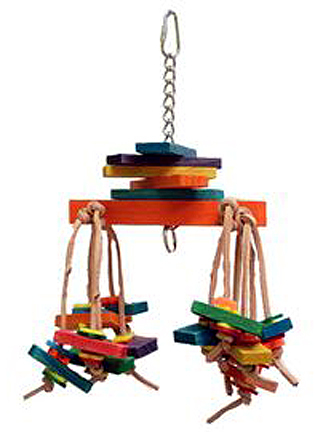 Colorful wooden slats are strung from nickel plated welded chain with a quick link on top for easy hanging with "legs" of Kraft Paper Rope, acrylics shapes (save and reuse time and time again), plus more slats to chew! This is a great toy sized for smaller to mid sized beaks in your life!